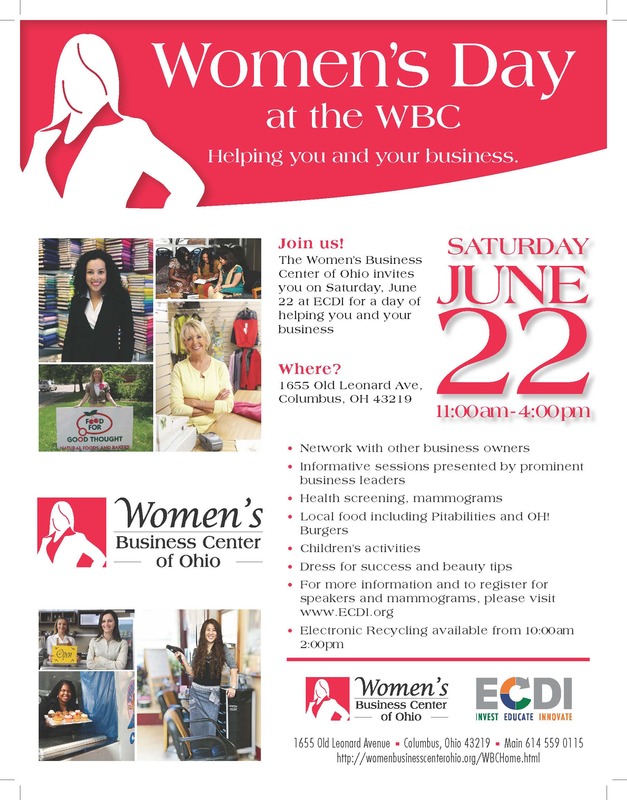 The Women’s Business Center at ECDI invites all to come with family and friends to celebrate Women’s Day on June 22nd from 11 am to 4:00 pm. The event will be held on the ECDI Campus at 1655 Old Leonard Ave. The day will feature family friendly activities, mobile food vendors including Pitabilities and Dan’s Deli 41, an e-waste recycling drive from 10 am to 2 pm, live music and guest speakers. Liz Lessner from Columbus Food League (Betty’s, Tip Top, Jury Room, Dirty Frank’s, Grass Skirt Tiki Room, Surly Girl Saloon) and Eartha Recycling will be a featured speaker at the conclusion of the day. individuals with barriers to employment to work! and $10 donation for TVs larger than 27”.